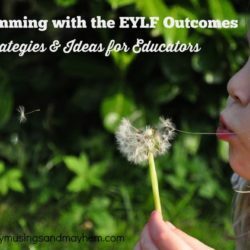 Australian early childhood educators are expected to develop and follow a planning cycle as well as meet EYLF (Early Years Learning Framework) outcomes to ensure that all children in care are supported to follow and extend their learning journey. There are principles, learning outcomes and different guidelines according to where we live that must be taken into account but for the most part it is important that educators develop a planning cycle and method of documentation that suits their own individual style. 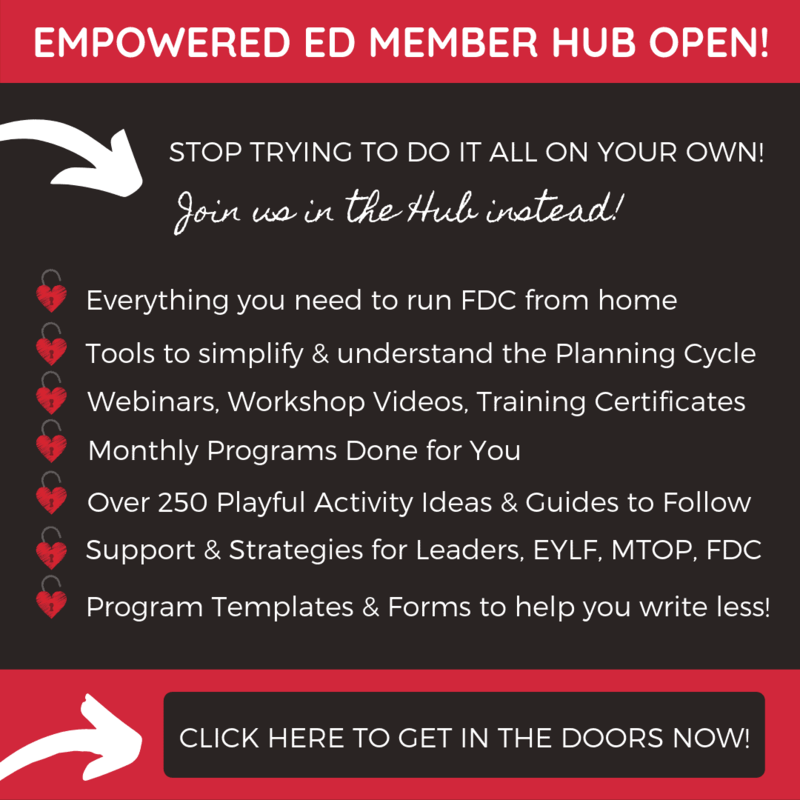 You can read more about my own planning cycle here but today I wanted to explore the evaluate and extend part of the cycle as I have been receiving quite a few messages from readers asking for help in this area. As always with my posts for educators, please remember that I share how I interpret things and how I have previously learnt through my own formal training but also through my own personal experience in different care environments. It may not be what you have been told or what your Director or Coordinator or Scheme requires so you need to be aware of that as you read. I do always encourage educators to question methods and procedures if they are being forced upon them though. You are a professional and as such have the right to question and seek clarification for the work and processes expected of you. But to do this means coming from a place of knowledge and understanding and confidence in your own planning style and systems so that you can confidently engage in debate.You may find this article on how to become an assertive educator helpful. 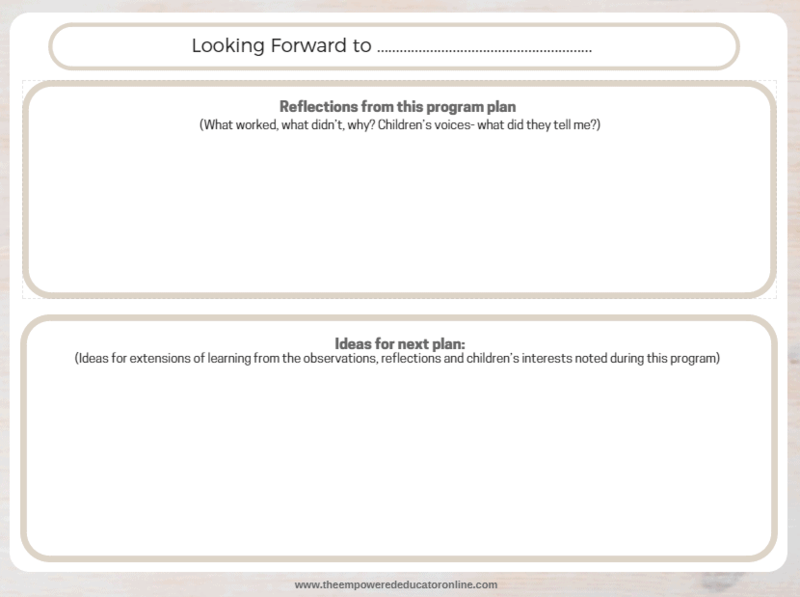 So you’ve completed the first step of the planning cycle and documented meaningful observations on the children in whatever format suits your style…now what? 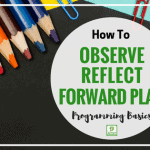 An observation isn’t much use to your overall planning if you haven’t reflected, asked yourself questions about the observation you recorded and then evaluated the answers. Without this step it is just an observation and that my friends has been a waste of your time. And no one wants that. 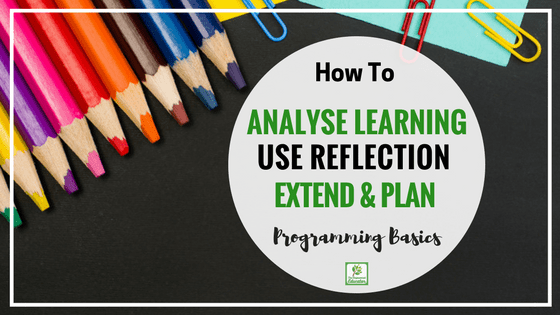 So let me break it down for you…..
What does analysing an observation mean in simple terms? How do I start? Well here’s what I always ask myself when I reach this step. 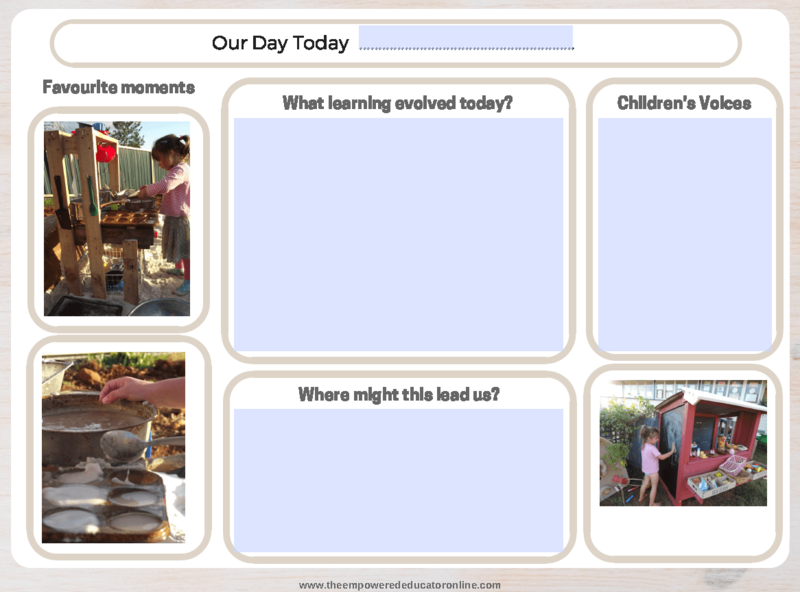 I learnt to do this over 25 years ago now during my training but I still think the questions are relevant, I have just incorporated a little of the language and context of the Australian EYLF outcomes now as well. 5 questions to ask when you make an analysis of your observation. 2. What strengths and interests can you identify from this observation? 3. Is there anything in this observation that concerns you from a developmental perspective? What can I do to support the child’s learning in this area? Who do I need to speak to about this? 4. 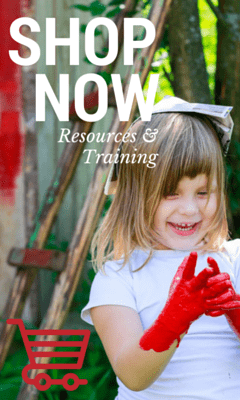 How could I further support and extend this child’s interest/strength/learning journey? 5. 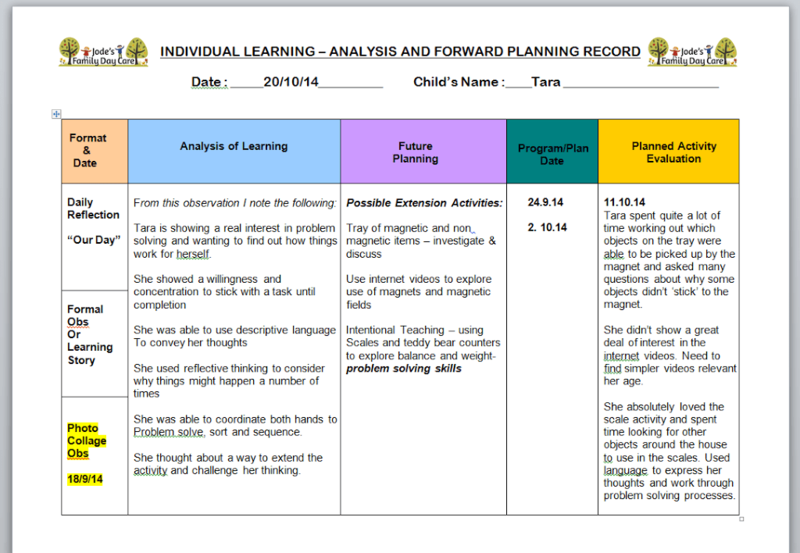 Is this learning observation significant – can I plan future experiences from this observation? I personally think the last question is very significant. There is no point trying to plan your environment and experiences for a group or individual child if the observation or learning that took place isn’t meaningful. When you first start taking observations it can be easy to fall into the trap of writing down every little thing a child does. With experience though you will see that it is more worthwhile to think about what you see happening in front of you first, engage with the child and if you feel it was significant write it down later. I like to take lots of photos, I never take notes as I’m not there to just observe every day. A child doesn’t want to see someone sitting there with their head down writing notes as they play. They want you to engage and be involved in their play even if that just means knowing you are there watching them and not actually directly involved. 1. Did I just wish I had the camera with me to capture that moment or did I just take 50 shots of that experience/group/child/activity because it blew me away? 2. 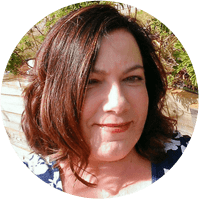 Did I want to share that moment with a co – worker or the parent/carer? 3. Did I think of a particular EYLF outcome (or they suddenly made sense) when I saw this particular interaction? It doesn’t matter how you do it, just be consistent so you always know where to find the information when you need it. 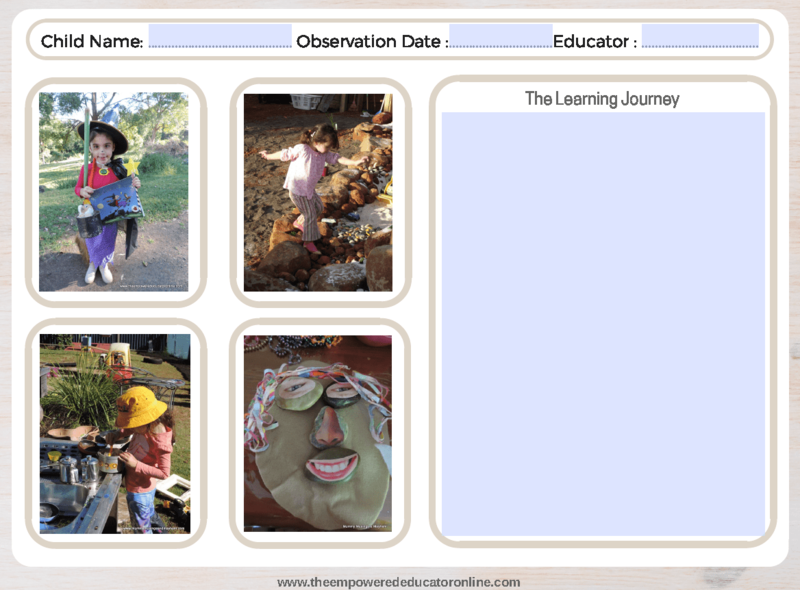 So now you have a written observation (in the format you prefer e.g learning story, anecdotal, photo collage etc), a review and evaluation from this observation of the learning outcome/strength/ interest that took place….now what do you do with it? You plan and extend! 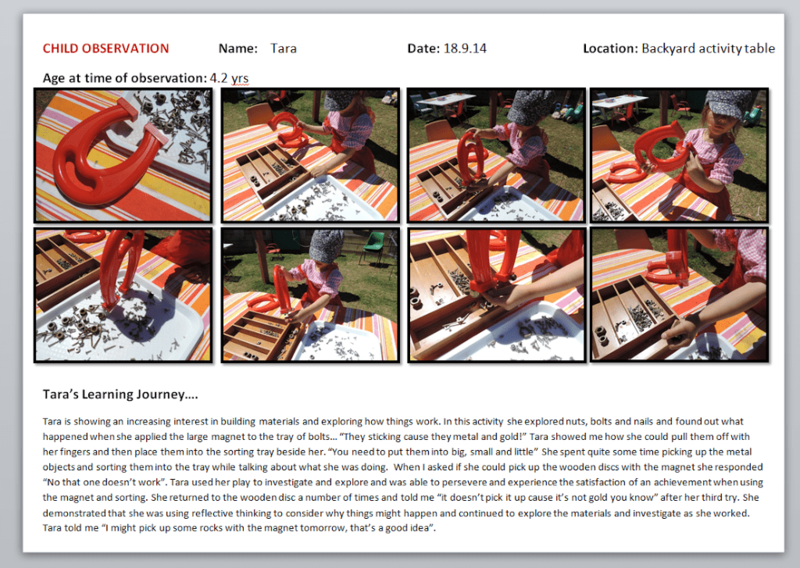 So let’s explore how we extend from our observation and evaluation of learning. 1. 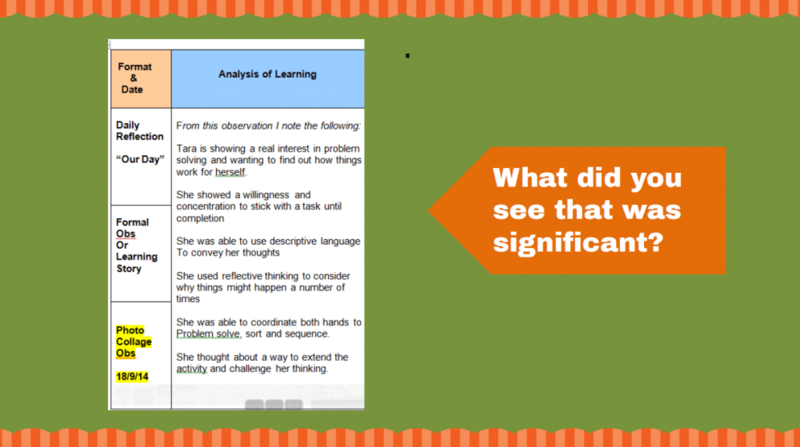 How can I further extend this child’s learning or interest in this area…where can we go from here? 2. 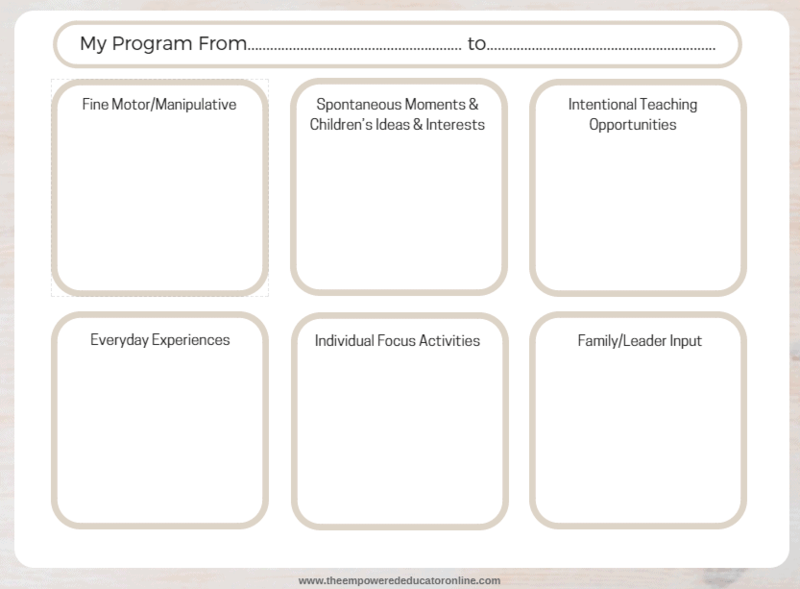 What specific activities could I plan that might fit into the program for not just the individual child but also the group? 3. Do I need to plan for an intentional teaching experience or just provide the environment and resources required? 5. When do I plan to put this particular extension into the program? 6. Is this extension a short term or long term goal? I write a summary answering these questions on my forward planning form and then add to my fortnightly plan in the ‘Individual Focus” box. 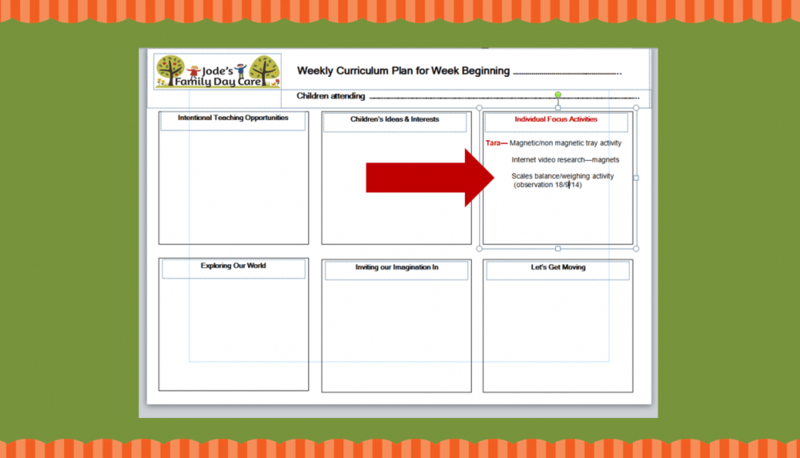 No codes, just the name and extension activity planned. Parents or others reading my plan don’t need to see all the specifics, I have the information all in one place on the forward planning form if I need to pull it out. Ok, final step in the cycle. 1. Was the child interested in the experiences provided? 2. Did the group join in the planned activity, experience, intentional teaching opportunity? How? 3. What would I try differently next time? 4. Was there any parent feedback or input regarding this experience? 5. Can I extend or further challenge? 6. Were there learning outcomes met? Were they different from those I originally planned for? Now you are back to the beginning of the cycle of individual planning! If you are able to keep reading without falling asleep I will take you step by step through how I do the above cycle. But please keep in mind that this is a system I have developed because it works for me. You could do something entirely different but the principles are the same overall. Ok, deep breath people, stay on your learning journey (ha…see what I did there?) 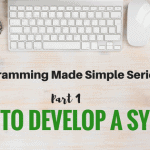 …here’s an example of the steps I take in my own programming…I hope it helps you connect as we move through each one. 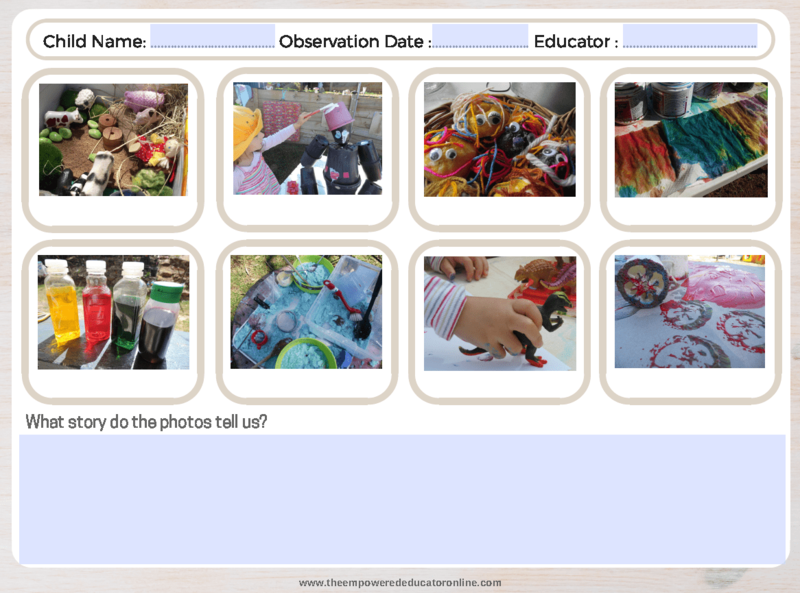 This is an example of my photo observation templates – pretty simple, the photos usually tell the story and are the main focus – text uses language of the EYLF and the child’s voice. There is no need to write to much, a few lines is sufficient – just make sure it is meaningful. if you feel these types of simple templates would work for you download the pack HERE. For more information on different observation styles and how to use them effectively read this article. 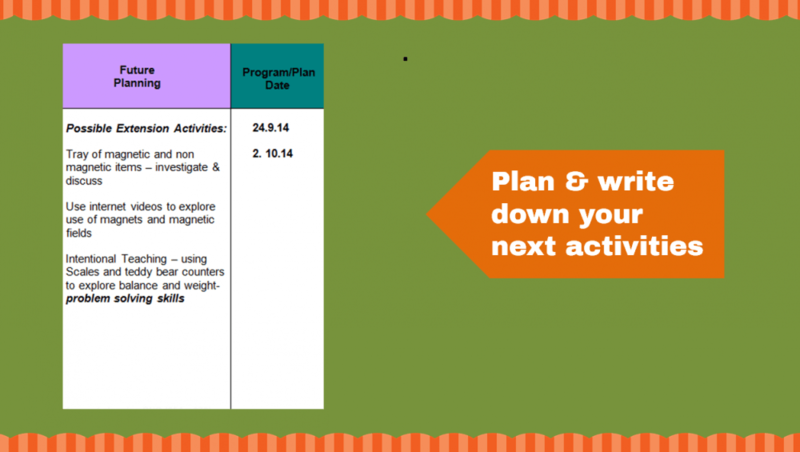 I then add the planned activities into my ‘individual focus activities’ box. No numbers or codes, just the activities. 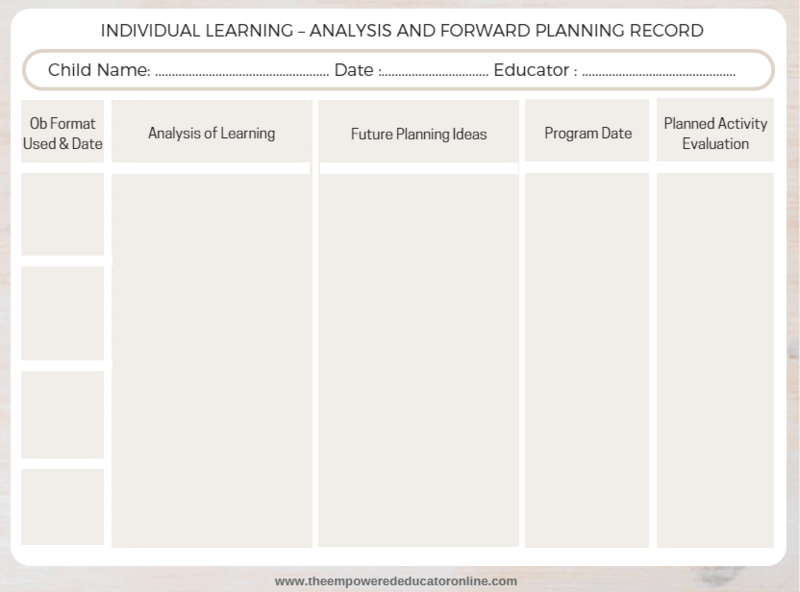 When the activities have been completed I go back to my forward planning form and do a short evaluation of the activity/intentional teaching. (yellow column). 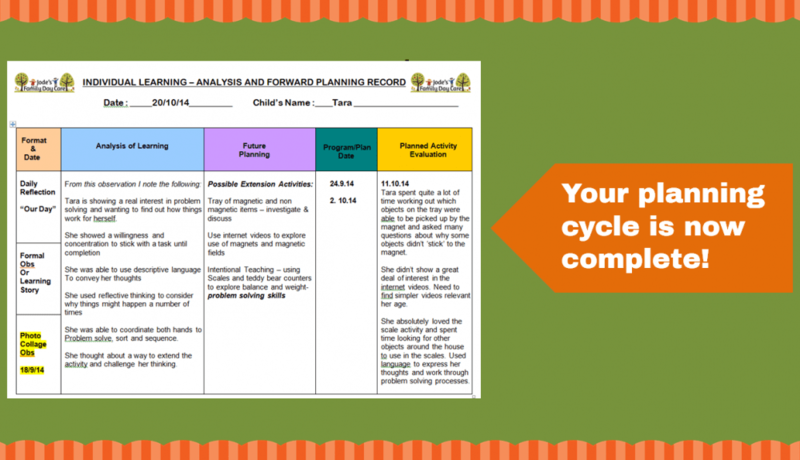 Now your analysis and evaluation as part of the overall planning cycle is complete! 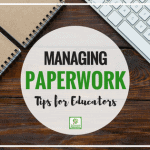 I hope this article has helped you to see the importance of the analysis and evaluation steps and clarify that you don’t need reams of paperwork to show evidence of an ongoing cycle of documentation. By thinking smart and fully understanding each step of the planning cycle you will be able to develop your own system with more confidence – modify according to your personal strengths, time management skills and the children attending your service. Need more in depth support with your programming? 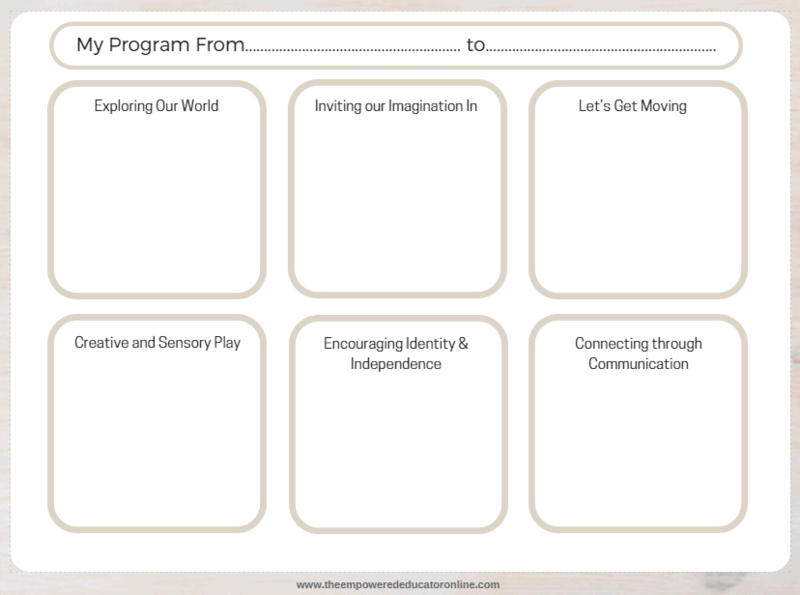 You will find lots of professional development opportunities and budget friendly value packs in my resource shop. « Recycling Fun with Rubbish and Pallets! Love this post and love your forms. 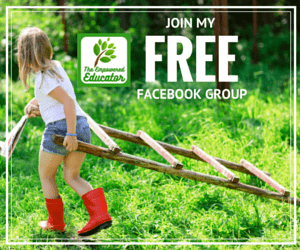 I can see them as being extremely helpful for my PreK and school age teachers. Thanks Linda, so glad you find them helpful! 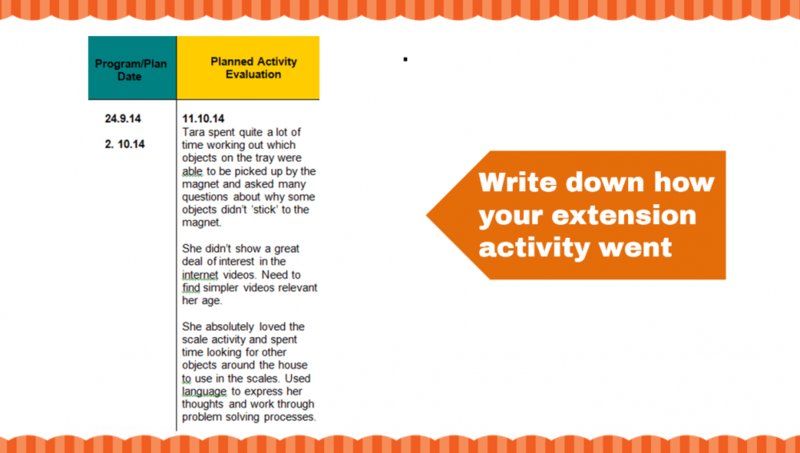 What is the difference between Evaluate and Reflection thank you. I quite often refer back to your blogs to remind myself on what I’m supposed to be doing. 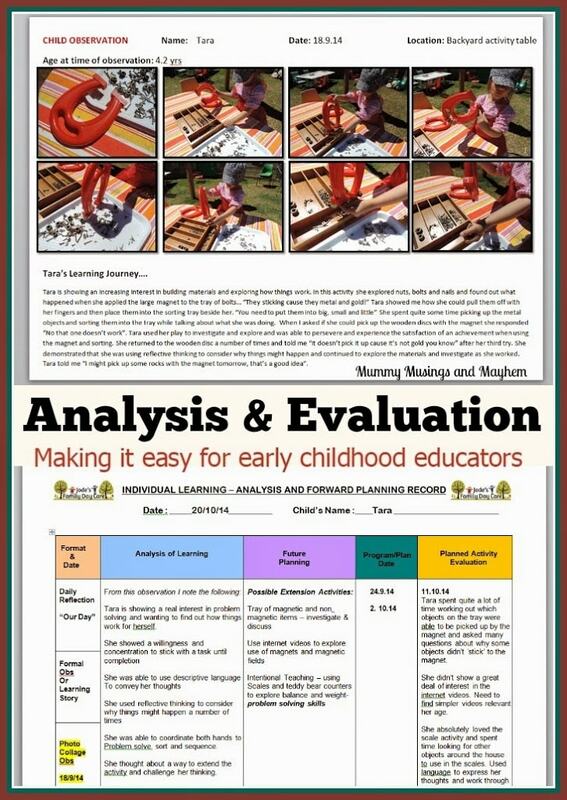 Random question though, does the analysis and evaluation form go into the child’s portfolio or into the educators ‘programming’ files? Personally I just put them into my own programming files either on the computer or hard copy. Up to you as educator though , nothing wrong with putting in portfolios but I’d still be keeping a copy together with your programming files as the idea is that using that form saves you time not having to look up the info again when extending and writing next weeks/months plan. I’m glad you find the blogs helpful!